It’s a great photo—a Rohingya woman holding a Canadian Foodgrains Bank bag of food. What’s not to like? Our logo is prominently displayed. It’s great marketing and public relations. There’s nothing not to like about it, unless something goes wrong. And as surely as Murphy of Murphy’s Law lives, something often goes wrong. One of the most common occurrences for food aid organizations is when food goes astray and ends up in a market for sale. When that happens, there are many reasonable explanations. The food might have been stolen—something not unusual in places where people are desperate, the rule of law is lax, there is conflict, or there are too many guns. Just about every place we send food aid, in other words. Or a recipient family sold the food—again, not unusual in places where people have many needs, including for food. Maybe they needed money for medicine to save a child’s life. Who wouldn’t sell food to do that? It could also have been traded for a cooking pot to a local seller in the market, or for any other much-needed item. Or the bag might simply have been used and thrown away, only to be used by a seller as a handy item for their shop. All reasonable answers, but meaningless if a story comes out about our food aid being found to sale in the market. When that happens, agencies like the Foodgrains Bank are in a losing race to try to contain the damage. Before you know it, it's gone viral on social media, causing damage and headaches for communicators and public relations practitioners. And damaging it can be; when your reputation is staked on making sure donations get to those who need it most, the "loss" of food can set you back in the public's mind. If we've done our job—if we've been proactive about talking about how challenging it is to do food aid—long-time and regular donors will know this, and not be worried. But during emergencies, like the terrible situation facing the Rohingya, many donors are first-time givers. They don't know what it's like to try to deliver food in places where almost everything has broken down, conflict is raging, or people barter food to meet other important needs. All they know is that food from the Foodgrains Bank was found for sale; suddenly, we look like poor managers, wasting the donations of Canadians. Thoughts about the opportunities and challenges of food aid came to mind following yesterday’s terrible attack in New York City. The attacker used a rented Home Depot truck to mow down innocent bicyclists and walkers. 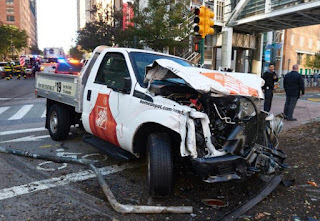 Photos from the aftermath of the attack clearly show the truck with Home Depot’s logo. Home Depot did nothing wrong, as far as we know, in renting the truck to a legitimate user. But still, there they are, associated with the attack, their name being used in most every news article about it. This is not the kind of publicity they were looking for, that;s for sure. It will be interesting to see how they respond—how will they deal with this image issue? An industry that has been proactive in dealing with these kind of public relations challenges is in the world of railways. Companies that transport oil and other dangerous chemicals in tank cars never make the news unless a train derails. Then they are all over the news. 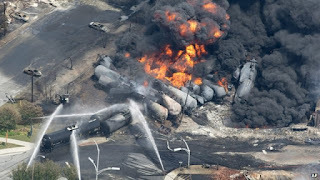 The oil and chemical companies have dealt with this by painting their tank cars a non-descript black without any company logos or names. All they have is the required reporting marks, along with other information about the car and its contents. When an accident happens, we see the cars laying askew off the tracks, but there are no company names. Of course, the companies will be noted in news coverage, but not in images that can quickly span the Internet. By keeping their names and logos off the cars, they proactively limit the public relations challenges. Contrast this with the 1930s-50s, when companies emblazoned their names and logos on the side of tank cars. It was part of their marketing strategy. But not today, not when everyone has a camera and people are so sensitive to environmental and other damage. When it comes to marketing through products and services, whether that's on trucks, tanker cars or food aid, it can cut both ways—good and bad. Those of us who work in communications need to be aware of both. Canadians and Foreign Aid: What Do They Think?